My daughter Aubrey is wearing a unicorn costume that is home made. I bought the fabric for the leg warmers and hand cuffs at Jo Ann's fabric for $9 and just used a hot glue gun to get their shape. I bought the hair from Sally's and also the hair spray color. This cost $29 for all of the hair and the color. I ordered the horn off of Amazon for $5 and also bought the leotard for $10. Finally the pink leggings I got at Walmart for $3. 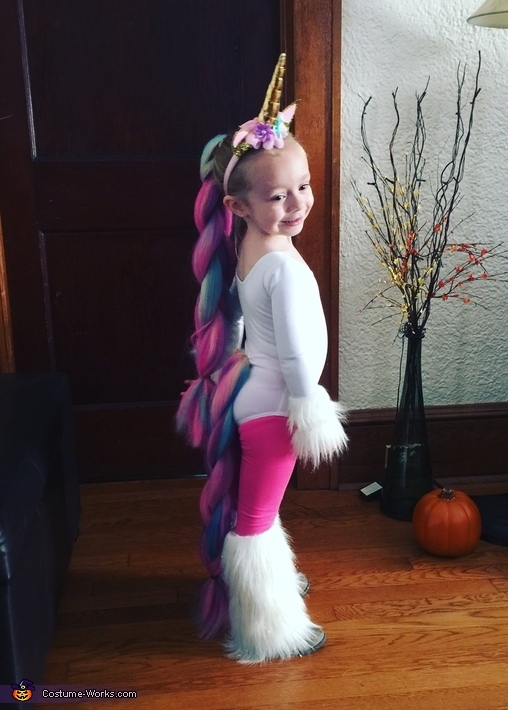 I got the idea from Pinterest after she told me she wanted to be a unicorn for Halloween.